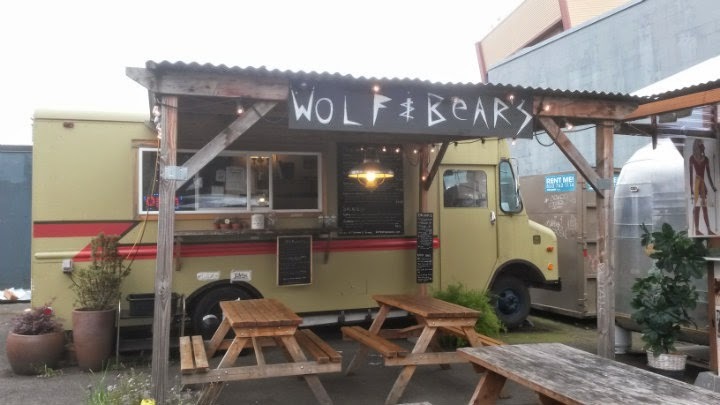 While looking back through my food blog a few weeks ago, I found it hard to believe that it had been roughly three and a half years since my last visit to Wolf & Bear's. While craving some falafel in mid-April, I had to stop by once again. They are still at the SE 28th and Ankeny pod (a.k.a. Pod28) after moving from SE 20th and Morrison in 2012. The menu is basically the same from when I was last there. Drinks also include fresh lemonade, Kombucha, and extracto coffee. The "Sabich" I got in 2011 is still on the menu. Menu items are now roughly 50 cents more expensive than in 2011 -- but of course, you'll see that just about everywhere. Yay inflation? This time, I did get the Falafel wrap ($7): Hummus, caramelized onions, roasted red peppers, grilled eggplant, parsley, falafel, salad greens, and tahini encased within a warm pita. It's a good-sized falafel wrap and totally hits the spot when you add their green hot sauce (zhug) to it. A colorful, appealing presentation. Four falafel balls inside the pita proved to be the ideal number. The flavors didn't leave me saying "wow," but certainly scores a recommend from me if you're craving falafel. The pita comes with sides: pepperoncini, pickle, and olives. I only saw the add-ons after I had ordered. Next time, I'd add feta (add 50 cents) and perhaps some grilled mushrooms (add 50 cents) and grilled jalapenos (add 50 cents). I think the added flavors and heat will bump that wrap up a couple notches.